The 2013 Scion xB receives revised interior and exterior styling, including a new front bumper, seat fabric, and optional BeSpoke Premium Audi system. The 2013 Scion xB is perfect for consumers who will not tolerate any sort of roundness to their vehicle (excepting the wheels, of course). Its basic boxy design features blunt angles on the outside and lots usable space on the inside, which makes it a step up from typical hatchbacks and even small crossover SUVs in terms of legroom and headroom—in fact, some cities even use these as cabs. The redesigned front bumper comes with a glossy black grille and LED accent lighting. The 2013 Scion xB is motivated by a 2.4-liter four-cylinder engine that produces 158 horsepower and 162 pound-feet of torque to the front wheels via a standard five-speed manual transmission, though a four-speed automatic is available. It’ll do zero to 60 mph in just 8.6 seconds, which is better than the average in this class. Scion News: 2015 Scions are on their way! 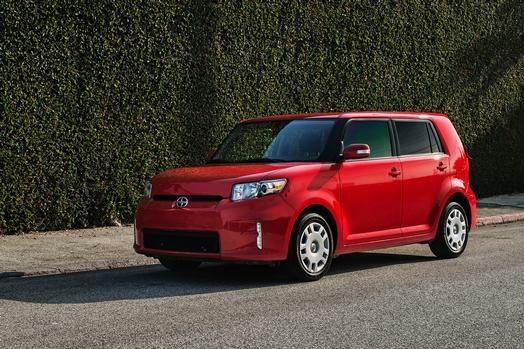 The 2013 Scion xB delivers 22 mpg city/28 mpg highway and 24 mpg combined according to EPA estimates. This is slightly below average but acceptable given the engine’s extra power. The 2013 Scion xB’s strength comes by means of its usable interior space. The tallest passengers are unlikely to ever feel cramped, even in the backseat and in the company of others. But if you don’t have passengers, folding down the rear three-person seat will open up an impressive 70 cubic feet of room that should easily be able to carry a weekend’s worth of luggage for a small family. The 2013 Scion xB comes standard with antilock brakes, stability control, traction control, front-seat side airbags and side curtain airbags. It received the highest possible rating of “Good” in the frontal, side, and roof crash tests by the Insurance Institute for Highway Safety.